This September, the American Red Cross joins in celebrating National Preparedness Month (NPM) 2015. The national theme for this year’s National Preparedness Month (NPM) is “Don’t Wait, Communicate. Make Your Emergency Plan Today”. Across the country, people are being asked to make their disaster plan now. Full details are available on the national campaign on the Ready.Gov NPM campaign page. The American Red Cross Gold Country Region encourages everyone to be ready for emergencies like home fires by creating a disaster plan for their household during National Preparedness Month. HOME FIRES National Preparedness Month is a good time to develop a fire escape plan and practice it with everyone in the household. When developing the plan, walk through the home and look at all exits and possible escape routes, including windows. List two ways to get out of every room in case fire blocks one of the paths. Pick a place to meet outside, a safe distance away and – no matter the circumstances – stay out of the home until fire officials say it is okay to go back inside. 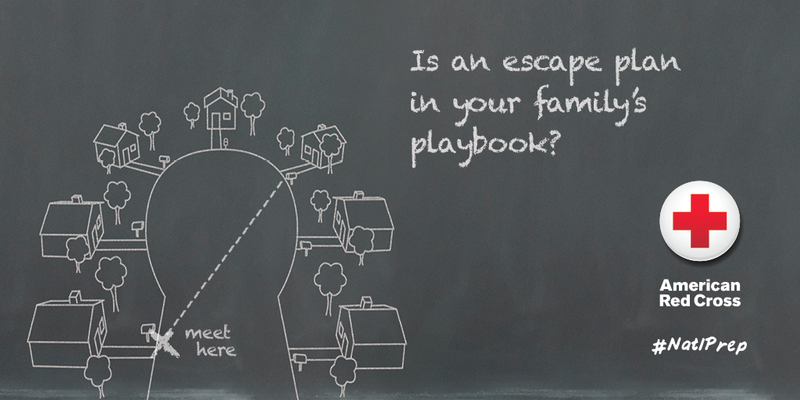 All households should practice their plan at least twice a year. People should also install smoke alarms on every level of their home, inside bedrooms and outside sleeping areas. They should test the alarms monthly, replace the batteries at least once a year and replace them every ten years. MAKE A PLAN Everyone in the household should help put the emergency plan together so they know what they should do if something occurs. Because everyone may not be together at home when a disaster happens, the plan should include ways to contact one another and two places to meet – one near the home in case of a sudden emergency like a fire, and one outside the neighborhood in case circumstances prevent people from returning home. The plan should also identify an emergency contact person from outside the area in case local telephone lines are overloaded or out of service. Any emergency plan should also include decisions about where to go if ordered to evacuate and what route to take to get there. It’s a good idea to include alternate routes in case roads are closed. Don’t forget family pets. Make sure to include plans for them such as pet-friendly hotels and animal shelters along the evacuation route. RED CROSS APPS The Red Cross has developed mobile apps that provide information on what to do before, during and after emergencies. The all-inclusive Emergency App and other preparedness apps have a “Make a Plan” feature on how to develop an emergency plan. Users can develop their plan and share it with household members through the apps. People can also download the Monster Guard App so 7 to 11 year-olds will have a free, fun gaming environment to learn how to prevent emergencies like home fires and stay safe in an emergency or severe weather. The free apps can be found in smartphone app stores by searching for the American Red Cross or going to redcross.org/apps.